Turn learning colors into a fun and easy activity this Valentine’s Day with these Heart Activities for Kids: Printable Matching Games! Tanya from The Natural Homeschool has created two fun matching games for you! One is simple: matching the same color envelope to the one on the opposite end of the page. But the second game can be used for multiple activities. For other Valentine’s Day activities, check out 2019 Valentine’s Day Learning Resources: Unit Studies, Coloring Pages, Science, Art, + More! 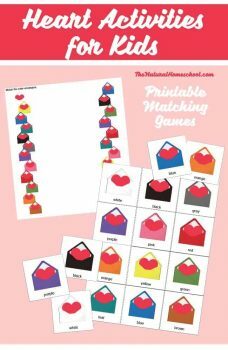 Grab these Heart Activities for Kids: Printable Matching Games today!